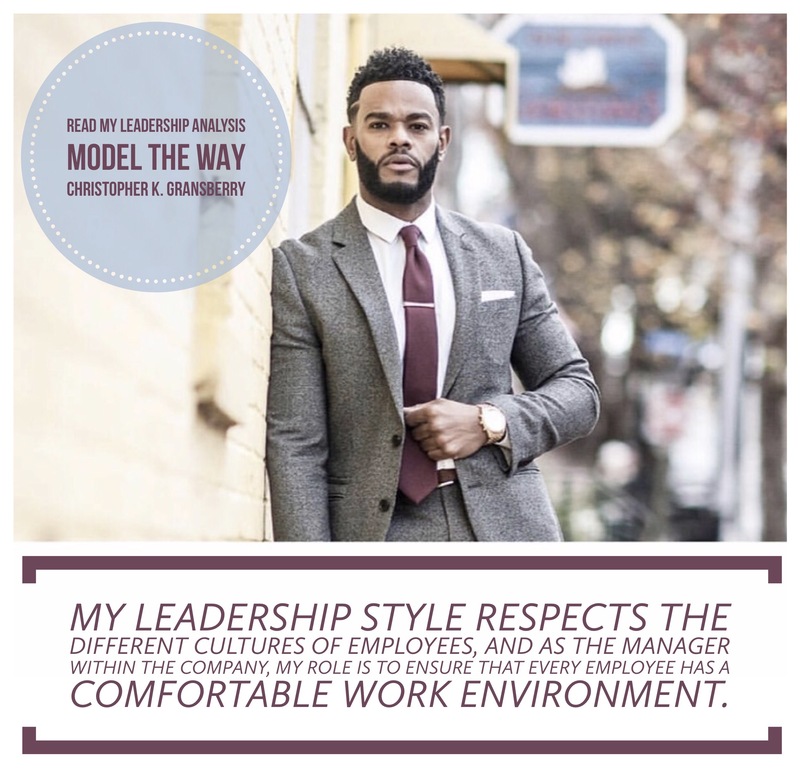 Model the Way Leadership Analysis – Christopher K. Gransberry Sr. In every organization, employees observe the behavior of their leaders, and this assists them in developing their attitude toward the work. Leaders then inspire their employees to achieve most of the objectives of their organizations. The qualities of a leader should portray an example of how the employees should conduct their operations. An effective leader should be able to model the way his or her employees behave at the workplace (Landrito, & Sarros, 2013). That involves clarifying the goals and objectives of the organization by being a good example to the employees. Many leaders lose sight of effective motivators. Happy employees are motivated to serve the customers of the organization in a better and more efficient manner. When the values and vision of the organization is made clear to the employees, they feel they are able to understand all their responsibilities while working for the organization. Understanding the needs and problems of the employees also create a positive relationship between the management and the employees. Employees should be allowed to express their opinions and ideas concerning any activity undertaken by the organization, and this is something Landrito, and Sarros (2013) recommend as one of the best ways of motivating employees. The freedom of expression granted to the employees assist the management team of the company in solving conflicts and issues arising in the organization. As the manager, I aim to ensure employees are happy because their happiness will be reflected in the services they deliver to the customers. Emphasizing the values of the organization to the employees creates a positive attitude in their minds, which facilitates the achievement of the goals and objectives of an organization (Best, 2011). The employees’ happiness leads to the satisfaction of the clients, thus in some organizations where I have business increased and raised the profits of the organization. The reputation of the company improved, and most of the people across the globe believed that my organization was the best in providing maximum satisfaction to their clients. As an effective leader, the success of the organization was as a result of setting an example for the employees to follow. An effective leader should always provide direction concerning the operations of an organization using appropriate examples. My greatest role as a manager was to work closely with the employees in order to understand their challenges at work and offer possible solutions. Providing an opportunity for every employee of the organization to take charge of certain organizational operations assisted them to develop their leadership skills (Best, 2011). The employees were able to perceive every problem in the organization —just as the managers do — and provide possible solutions for every challenge. Additionally, the employees were encouraged to work in teams while performing their roles. Teamwork in every organization has been linked to positive results, and is encouraged by the employees. When the employees are working in teams, and they have a common objective to achieve, they have a great chance of accomplishing their objectives in an effective way compared to a scenario where a single employee is doing the work alone. The act of embracing diversity in the organization assisted in appreciating the skills and abilities of the different employees. My leadership style respects the different cultures of employees, and as the manager within the company, my role is to ensure that every employee has a comfortable work environment. There are different lessons and important factors that I learnt as the leader within the various companies I worked for. One of the important things that I learned was that the success of every organization depends on the relationship between the management and the employees (Best, 2011). Employees will always respond to the behavior and character of their leaders. If the leader is offering the appropriate support and motivation to the employees, then there is possibility of positive feedback from the employees (Best, 2011). I noticed that when the employees are protected and motivated while at work; they demonstrate a positive attitude towards work and serve the clients in the best way possible. The other lesson that I learned was that teamwork is crucial to the achievement of organizational goals and objectives (Gagnon, 2012). The collaboration between the employees and the management team assisted in identifying the challenges of the organization and employing appropriate measures to solve the issues. Teamwork enabled the employees to realize the values and goals of the organization and how they could be used to energize the business despite various challenges. With a better understanding of how the values and goals of the organization linked to the challenge of delivering products, as well as how it could be managed, it was easy for all the employees to deliver standard services for the company. As the leader within the organization, it was evident that to be ahead of competitors, an organization needs to utilize every available opportunity to maximize its value to customers (Gagnon, 2012). This is exactly what happened during the challenge of meeting the needs of customers. The different skills and cultures of the employees can also facilitate the achievement of the organization’s goals and objectives (Abu-Tineh, Khasawneh, & Omary, 2009). I learned that it is the role of the management team of every organization to ensure that it promotes diversity among the employees. Diversity in the organization will ensure that each and every effort put by an employee toward the growth of the business is appreciated — regardless of his or her culture (Abu-Tineh, Khasawneh, & Omary, 2009). The “happy” culture of the company, the belief that the organization’s culture would assist the employees in the delivery of effective services to the clients demonstrated the importance of having organizational culture. There are several ways, which a leader can use in modeling the way for the employees in the organization (Norris, 2008). One of the ways is through promoting an innovation mind in the employees. An innovation mind will assist the employees to apply modern technology and skills in their operations. With the aid of the modern technology and skills in the operations of the organization, the employees will be able to deliver quality and effective services to their clients. Another method for self-improvement is promoting the concept of self-leadership in the organization (Norris, 2008). Self-leadership in an organization will assist every employee to identify all the possible challenges in the organization and implement the appropriate corrective measures in solving them. When every employee has the mind of a leader, he or she will be in a position to offer quality services to the clients. By having a leadership perspective, each employee’s efforts will be directed toward achieving the goals and objectives of the organization. In turn, the achievement of the organizational goals and objectives will lead to the satisfaction of the customers, and as a result, there will be an increase in profits of the organization (Norris, 2008). Additionally, some personal attributes can be imparted to the employees. A good example is self-efficacy. Self-efficacy will assist the employees to have an attitude of self-control, and that will make them concentrate on the goals and objectives of the organization (Norris, 2008). In conclusion, a leader will only serve as a model to the rest of the team after forging an effective relationship with his or her employees in the organization. Therefore, promoting a positive relationship between the management and the employees will assist in achieving most of the goals and objectives of the organization. An effective leader should be able to provide solutions for any issue arising in the organization. Providing the employees of the organization with the freedom to express their opinions and ideas will also assist in solving any form of conflict between the management and the employees. For organizations operating in different parts of the world, having a diverse team and making it mandatory to respect and appreciate different cultures will result in a vibrant team that respects diversity. Most importantly, it is crucial to impart in every employee of the organization some leadership qualities because that will enable them to have a leader’s mindset when performing their roles. Abu-Tineh, A., Khasawneh, S., & Omary, A. (2009). Kouzes and Posner’s Transformational Leadership Model in Practice. Journal of Leadership Education, 7(3), 265-283. Best, K. (2011). Holistic Leadership: A Model for Leader-Member Engagement and Development. Values based leadership journal, 4(1). Gagnon, E. (2012). The Perspective and Practice of Leadership by Managers within a State Correctional Agency: An Instrumental Case Study. International Journal of Leadership Studies, 7(1), 1-23. Landrito, L., & Sarros, J. (2013). Effective Leadership and Workplace Diversity. International Leadership Journal, 5(2), 1-113. Norris, S. (2008). An Examination of Self-Leadership. Emerging Leadership Journeys, 1(2), 2-19.